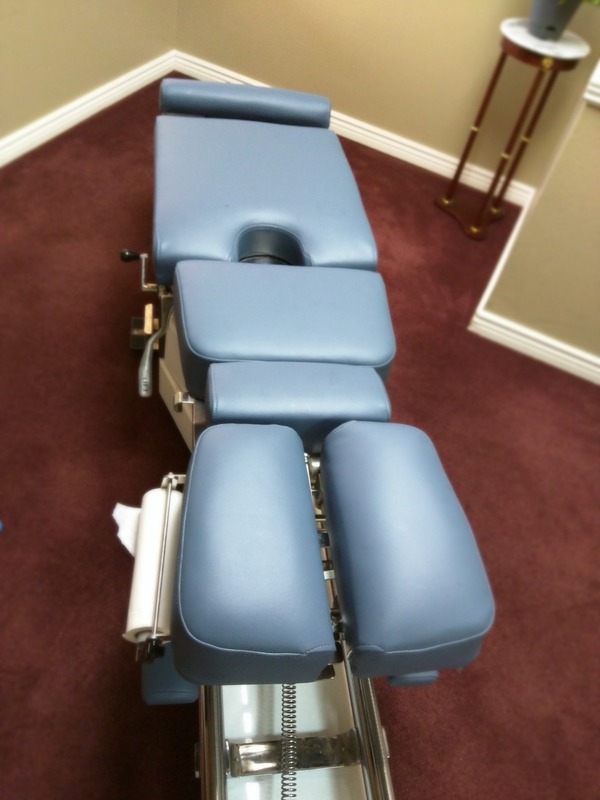 We were excited to hear from Dr. Del Vecchio’s office about recovering a chiropractic table. 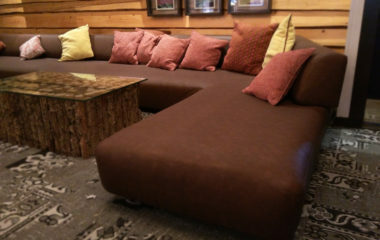 Even though it had been several years since we initially spoke, we were able to offer the same great rates. Our unique business model has buffered us against the extreme spike in the cost of rent and real estate and ultimately they haven’t impacted our pricing. 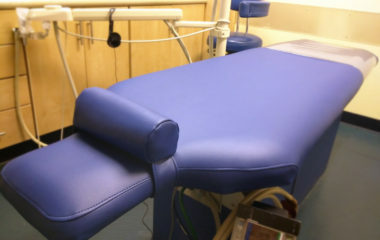 On our initial visit it was apparent that the upholster who had previously serviced the chiropractic table had done some repair work in a different material and technique that didn’t match very well. 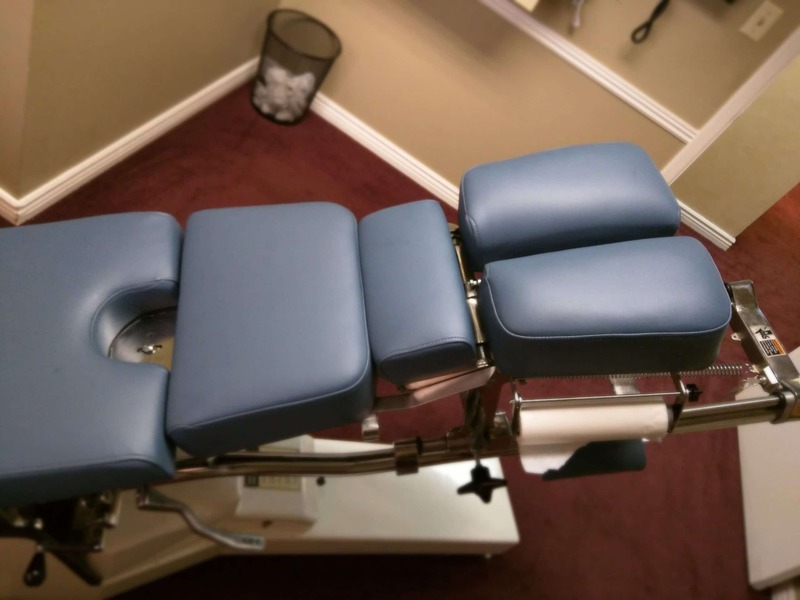 Since several pieces also needed to be done and we offer a complete chiropractic table recover discount; the decision to completely recover the table was an easy one. 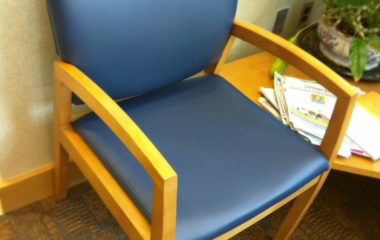 We left the staff with a sample card and the doctor selected Blue Ridge, a great color in the very high durability Olympus vinyl. We know that our customers time is important so we strive to be punctual on every point of contact, the total time from the initial estimate to scheduling was 4 days. The old style of covering the pads, however, utilized Hidem Welt winch was not available in Blue Ridge. Rather than using or making something that would be less than aesthetically pleasing, and only after consulting with the doctor, we used black dust cloth on the bottoms of the pads. 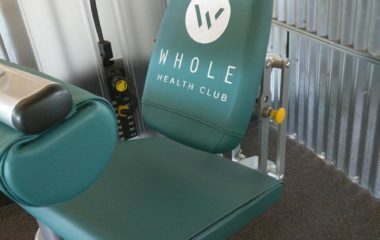 This allowed us to complete pad recovers that were crisp and clean and would not distract from the innate beauty of his power chiropractic table. We were a little behind schedule that day, but because we remain dedicated and on task we were still easily able to complete all of the service before the staff left for the day. The entire time on site was just about 4 hours; the total time from initial estimate to the completion of the job was 10 days.